Oil Search Limited (OSL) may be going all hands on deck with the relief supply efforts, but with a little help from other organisations, a whole lot more can be achieved. 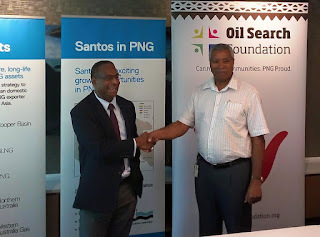 Today Oil Search Foundation got such a help with a generous donation of 200, 000 US dollars (over K630, 000) from Santos Limited to go towards its relief efforts underway in the earthquake hit areas in the highlands and parts of Western and Gulf provinces. Santos Limited PNG Country Adviser, Mr. Ces Iewago said as a partner in the LNG project, they hope the donation will help. “Its also a token of appreciation that we have in the LNG project and going forward in supporting these sort of causes in the country,” said Iewago. Oil Search Executive Manager Mr. Gerea Aopi said this donation is the highest so far being donated by other organisations to the Foundation for the earthquake relief assistance. Meanwhile, OSL has so far covered vast areas in conjunction with the government and aid organisations in providing the much needed relief supply to earthquake hit areas. The company’s Managing Director, Mr. Peter Botten, in a media briefing in Port Moresby yesterday revealed that the company through its efforts has provided assistance in the form of medical supplies and other necessary items. Mr. Botten said about 70 villages and over 70,000 people have been reached so far in the relief exercise.